I am excited to announce that my favorite season has officially arrived….well, at least it has on the calendar. It still feels like summer here in the Tarheel State, the leaves aren’t changing yet, and I haven’t quite broken out my scarves and sweaters yet. But I am decorating for fall and I can’t wait to show you my fall decor this week! In the meantime, I want to share some of these cute fall pillows I found while browsing Pinterest one recent night when I couldn’t sleep. Side note: has anyone else been having a fit with their insomnia lately? I can’t be the only one. My insomnia has been doing wonders for my Pinterest boards, my home design, and my organization skills, but not much for my checking account. I keep finding things I want, and these cute fall pillows are certainly no exception. Pumpkin Lumbar Pillow, $34.99 at Wayfair. I really like this- it’s cute without being too stuffy, and it would go with most anything. This pillow cover is from Etsy. I really like the fabric pumpkins, and I bet this would be pretty easy to make. In fact, I’m thinking of making some of these myself. I like this one just because it’s simple and has lots of different colors. Plus, it has pumpkins and bittersweet on it. Guess what’s in my living room right now? I am a huge fan of Rae Dunn’s pottery and have several of her coffee cups, but I had no idea she made pillows, too. This is super cute and I can think of many places where I’d use it. I hope you have enjoyed this Pinterest round up. Stay tuned for a fun fall craft this week and my fall tour. Maybe my sleepless nights will result in even more cute things to share with you. I was in search of something new and cute to hang behind the crib, but it had to be inexpensive and cute. I love this sign at Magnolia, but it was a little more than I wanted to pay… and since Waco is over 1,000 miles away, shipping would be pretty expensive as well. Cue the DIY side of my brain. I bought a piece of foam board, and got to work. I used a computer to create a large poster with the verse I wanted, and I sent it to a local print shop. I then Modge Podged the poster onto the foam board. After it dried, I popped it into a barn wood frame. While I could have used less white space, I have to say I like how this sign turned out. Plus, it looks great hanging behind the crib. What recent DIY have you completed? I love grain sacks so much. I have two of them in our dining room. I had an awkward space in our hall and wanted another grain sack to occupy the space… except I couldn’t find what I wanted. As usual, when faced with high costs or low availability, I decided to create my own. Ain’t she a beaut? I went to Walmart and found these handy-dandy burlap sheets THAT YOU CAN FIT IN YOUR PRINTER!! How awesome is that? You can probably guess what happened next… I popped one of those burlap sheets into my printer, printed that grain sack on it, and popped it into a frame. The result? What cute, easy farmhouse crafts have you done lately? Pardon the snow pictures; since my server crashed earlier this year, I’ve lost many of my pictures. Not bad, but this eyesore wasn’t doing a thing for our home’s facade. Our garage door was big, white and booorrrring. I’ve been crushing on Coach house garage doors since forever, but because they run in the upwards of $2,000, they aren’t exactly in the budget right now. As usual, I decided to get creative. I had an Amazon gift card to burn, and I’ve looked at these several times. It took me about 30 minutes to put them all on the door. I would recommend having a “spotter” to stand back and help you determine if you’re putting your “windows” on straight. Other than that, these things are easy-peasy to install. I texted a picture to all my family when we were finished and several of them asked when we got a new door. Doesn’t our house look so much better? Isn’t that a thousand times better? It’s amazing what just a simple, $50 change can do for your home. 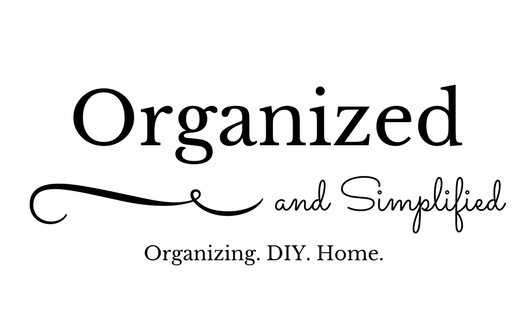 Saturday: Simplify Saturday: Your paper clutter problems solved!